American Funds Investment Company of America A (AIVSX) Fund is a popular domestic stock mutual fund. This stock fund invests in U.S. stock companies. As one of the top mutual fund family, American Funds is also one of the most popular funds. One of these popular funds is American Funds Investment Company of America A (AIVSX) fund. This Investment Company of America fund invests mainly in US companies stocks. Details about the fund review can be found below. The investment objective of American Funds Investment Company of America fund is to provide long-term capital growth and income. This American Funds fund invests mainly in common stocks, most of which have a history of paying dividends. It may invest small part of assets (<15%) in foreign securities. This large blend stock fund focuses its investment in medium to larger capitalization companies, though it may invest in any capitalization size. James B. Lovelace is the current lead fund manager of this AF fund. He has been managing this popular domestic stock fund since March 1992. This large blend stock fund has been in the market since 77 years ago. The total net assets of this fund are $55.79 billion. It has 0.61% annual expense ratio. This figure is lower compared to the average in Large Blend category (1.14%). The dividend yield of this fund is 2.06% and is paid quarterly. The last dividend was distributed in September 16, 2011 ($0.13). This AIVSX fund requires a minimum of $250 to start investing for either brokerage or IRA account. The minimum subsequent investment is $50. There is 0.23% 12b1 fee and 5.75% front-end sales load fee. There are 76 brokerages in which this fund can be purchased, such as Merrill Lynch, Scottrade Load, JP Morgan, Vanguard, Edward Jones, Schwab Retail, Fidelity Retail Funds Network, E Trade Financial, Royal Alliance, etc. This fund is available in other classes like Class B (AICBX), Class C (AICCX), Class F-1 (AICFX), Class F-2 (ICAFX), Class 529-A (CICAX), Class 529-B (CICBX), Class 529-C (CICCX), Class 529-E (CICEX) and Class 529-F-1 (CICFX). The 10 largest industry holdings of this fund as of September 2011 are Oil Gas & Consumable Fuels (9.9%), Beverage & Tobacco (7.3%), Software (5.6%), Diversified Telecommunication Services (5.4%), Pharmaceuticals (5.1%), Semiconductor & Semiconductor Equipment (5.1%). 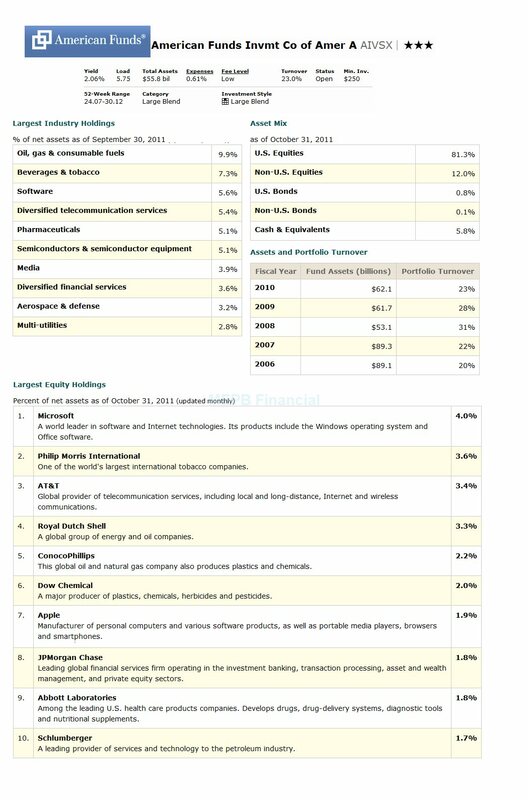 The top 10 largest equity holdings as of October 2011 are Microsoft (4.0%), Philip Morris International (3.6%), AT&T (3.4%), Royal Dutch Shell (3.3%), ConocoPhillips (2.2%), Dow Chemical (2.0%), Apple (1.9%), JP Morgan Chase (1.8%), Abbott Laboratories (1.8%), and Schlumberger (1.7%). According to the fund’s prospectus, the principal investment risks include Market conditions, Investing in Income-oriented stocks, Investing in growth-oriented stocks, Investing outside the United States, Management, etc.